*This review was originally published on Hello Cinema. Mohsen Makhmalbaf’s Hello Cinema (Salaam Cinema, 1995) opens with shots of a crowd of thousands of segregated men and women, impatiently and chaotically waiting as a small car arrives and passes through the labyrinthine, narrow streets of north Tehran. The unsuspecting viewer would be forgiven for mistaking the scene for footage from a political riot, especially when the ensuing mayhem results in the entire crowd pushing through an outmuscled gate. 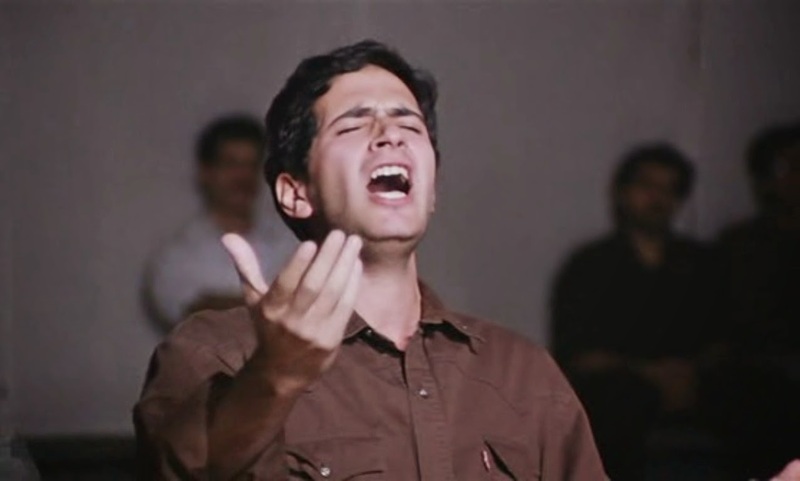 The beginning of Hello Cinema serves multiple purposes: exposing the extent to which cinema enjoys popularity among Iranians of all ages, genders and social strata; cheekily shedding light on a culture that has little respect for social decorum; and establishing the film as a documentary, a distinction that is mysteriously and intriguingly up for debate to this day. Makhmalbaf’s original idea was to make a film that celebrated the 100th anniversary of cinema, but when the casting call for 100 actors brought in nearly 5,000 contestants to Tehran’s Ferdows Garden, the director began to shape his film around these audition tapes. The final product is an innovative tribute to the possibilities of the cinematic medium and an astute evisceration of both the history and status quo of Iranian cinema. Hello Cinema was made at a time when the national cinema of Iran was at the height of its international popularity. Jafar Panahi was about to release The White Balloon, his first major global success, and Abbas Kiarostami’s Close-upand Through the Olive Trees had just made the festival rounds, with A Taste of Cherry on its way to Cannes, where it would win the Palme d’Or. It was also made at a time when Makhmalbaf was beginning to shift his focus slightly from the patently political likes of Nasuh’s Repentance and Marriage of the Blessed to the structurally challenging, evocative brilliance of A Moment of Innocence. This was a filmmaker transitioning from being an ideologue with a creative spirit to a provocative auteur. There would be no ideologically motivated sounds of dogs barking, no opening a film with a call to all angels to come to the world’s rescue (shorthand for the martyrs of the Iran-Iraq war). This was a film about the cinema itself. Yet, Makhmalbaf is at the forefront of his film and his engaging, complicated but aggressive personality breathes life into a work of art that could have otherwise been reduced to an academic experiment. Hello Cinema is a frank discussion about the meaning of art, its place in society and the ambitions and challenges of its practitioners. Few directors would take a premise as narrowly straightforward as a series of audition tapes stitched together and turn it on its head to discuss issues as varied as a nation’s justice system, the history of domestic genre filmmaking, and socially entrenched ideas about virginity, motherhood and women’s role in society with equal perceptiveness and humor. Makhmalbaf had the audacity—and enjoyed, at the time, a rare position with the Iranian censorship system—to extend his reach to such far horizons. The resulting film is a timeless rumination on the process of filmmaking and, paradoxically, a time capsule for the director himself, a bewilderingly unique persona caught at his artistic peak, immediately following the end of his religiopolitical sermons and a short while before beginning a process of rebellious emancipation.